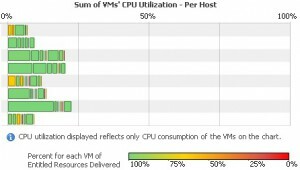 We found that setting the server BIOS or ESXHost Advanced Settings to a Balanced CPU Power Policy creates additional CPU Wait times for VMs with more than a single core. This is seen more-so in VMs with four or more cores. If you click on the cluster level object, it will populate more windows on the right. With the BIOS and ESX Host setting at “Balanced” we see hosts with low CPU usage but higher CPU wait times. When we change this setting to High Performance, the entire cluster turns green! Check out this post on how to check and set this setting at the ESX Host level via PowerCli. 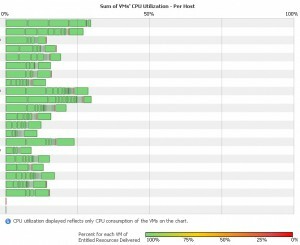 This will set the Advanced Setting “CPU Power Policy” for a host. Keep in mind that some servers require that the BIOS CPU Power management setting be changed to “OS Control” for the ESX Host setting to work. 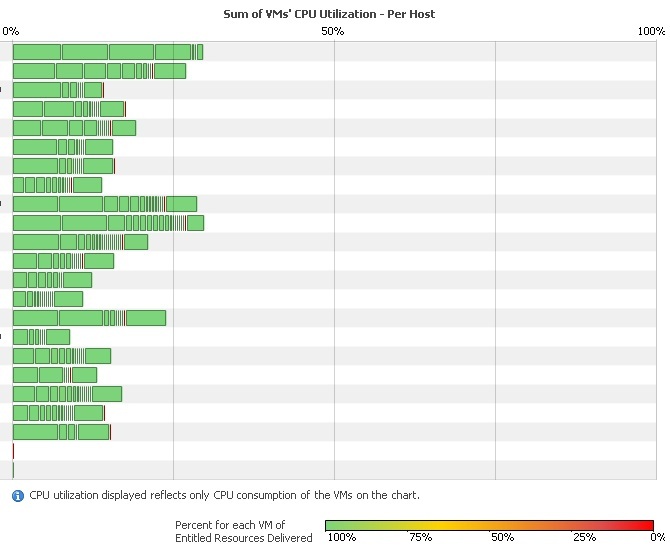 Setting the BIOS to High Performance may use more watts but may reduce CPU wait time for VMs. Waiting for a CPU to “power up / boost to full speed” will create CPU wait time. You can add a host list array, or remove the hostname from the get-vmhost part if you want to check vcenter or cluster wide settings. The same goes for the Set-VMHostAdvancedCOnfiguration line. Creating a foreach loop for each host in a cluster will keep all hosts configured the same. This code will create a new Distributed switch at the datacenter level of your vcenter. Keep in mind that distributed switchs are vCenter objects instead of host objects. I’ve found that the Powershell Window performace is limited unless you make some changes. Below are some quick things you can do to increase the performance and hopefully reduce the time of your script execution. – This command will check and set the Max Memory that each Powershell session can use. – This command, added to your script, will run garbage colection and free up some RAM. – It was found that Windows Tasks will launch your Powershell scripts at “Below Normal” CPU priority. This is how you can fix that issue. Its a pain but VERY worth it if you use Windows Tasks to launch your scripts. Step1 – Export your Task to an XML file. – You should see that the orginal is set to a value of 7. Setting it to 4 makes a world of difference. Step3 – Import the XML back into the Tasks window. Doing this restore will allow all VMs to go from “invalid backing” to the real portgroup name, and all hosts will show their nics attached to the vDS. Backup your Distributed Switch configs to a zip file. This script will backup your Distributed Switch config to a zip file. You can then use this zip file to restore the vDS to a new vcenter or if your vcenter database corrupts. This code will create a new vswitch on all hosts in the cluster and assign adapters.